Now is a critical time in pediatric informatics. As information technologies-electronic health records (EHRs), personal health records (PHRs), computerized physician order entry (CPOE)-and standards (HL7) are developed to improve the quality of health care, it is imperative for policy makers and pediatricians to be aware of their impact on pediatric care and child health. Informed child advocates must be at the planning table as national and regional health information networks are developed to insure the unique health care needs of children are being met. 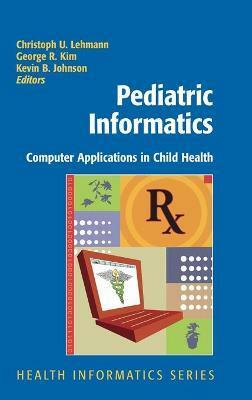 Pediatric Informatics: Computer Applications in Child Health is a current digest of the important trends in pediatric informatics, written by leading experts in the field. This book explores how the management of biomedical data, information, and knowledge can optimize and advance child health. The contributors investigate the specific importance of pediatric informatics is derived from the biological, psychological, social and cultural needs that the distinguish children from other populations. These distinctions create complexities in the management of pediatric data and information that make children a vulnerable population and require the development of a new body of knowledge in pediatric informatics. Illustrations note 40 Illustrations, color; 4 Illustrations, black and white; XXIV, 484 p. 44 illus., 40 illus. in color. Series preface.- Foreword.- Contributors.- Section I. Introduction to pediatric informatics.- 1. Preface: Snapshots of child health and information technology.- 2. Informatics and pediatric healthcare.- Section II. Special considerations in pediatric care.- 3. Core pediatric data.- 4. Neonatal care and data.- 5. Special health information needs of adolescent care.- 6. Children with developmental disorders & other special needs.- 7. Pediatric emergency and critical care considerations.- Section III. The pediatric data-knowledge-care continuum.- 8. Complexity in healthcare information technology systems.- 9. Pediatric care, safety and standardization.- 10. Evidence-based medicine and pediatrics.- 11. Clinical practice guidelines: supporting decisions, optimizing care.- 12. Diagnostic decision support.- 13. Managing pediatric knowledge resources in practice.- 14. Supporting continuing pediatric education and assessment.- Section IV. Informatics and pediatric ambulatory practice.- 15. The Medical Home and the business case for pediatric health IT.- 16. Prioritizing pediatric investment for IT in smaller practices.- 17. Aligning Pediatric Ambulatory Needs with Health IT.- 18. Electronic Health Records and Interoperability for Pediatric Care.- 19. Ambulatory Computerized Provider Order Entry (ACPOE or e-Prescribing).- 20. Telemedicine Applications in Pediatrics.- 21. Personal health records.- 22. Privacy issues.-23. Electronic mail in pediatric practice.- 24. Information management by patients and parents in health and disease.- Section V. Informatics and pediatric inpatient practice.- 25. Overview of inpatient pediatric medication delivery.- 26. Prescribing/Ordering: Computerized Order Entry and Decision Support.- 27. Dispensing: Pharmacy Information Systems.- 28. Medication Administration and Information Technology.- 29. Understanding and preventing errors.- 30. Error Reporting Systems.- Section VI. Frontiers in pediatric informatics.- 31. Health Information Exchange (HIE) in Pediatrics.- 32. Pediatric Data Standards.- 33. The Case for a Pediatric Terminology.- 34. Pediatric Research and Informatics.- Section VII. A vision and current landscape of pediatrics.- 35. Conclusion: The moving picture of pediatric informatics.- 36. Appendix: Resources. Both authors are pediatricians and informaticians with significant experience and expertise in the field of informatics, and both have trained in informatics through the National Library of Medicine. Dr. Lehmann's expertise resides in the development, application and evaluation of clinical information systems in pediatrics with an emphasis on improving health care quality. He is a faculty member in the Division of Health Information Sciences at the Johns Hopkins University School of Medicine. Dr. Kim's area of expertise lies in ontologies and consumer health informatics. He is also an expert in information retrieval.